There are 4 major colored pencil techniques you need to know in order to achieve mastery. 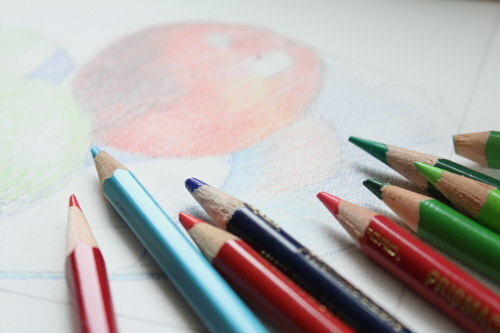 Layering - The layering technique is unique to colored pencils. It is the central basic technique. You add color gradually applied, dark to light(on a white or light colored paper). Paintstaking layering allows you to build increasingly complex values, hues and textures. You will find harder pencils work better than softer pencils for this technique. By adding more or less pigment, varying the pressure as you go on, you can control values or the overall look of an artwork. And always keep your colored pencil sharpened. I know it is a hassle but it is worth the efforts. Have your sharpener handy all the time. Burnishing - This technique is used to achieve further luminosity and gives it a punch where the layering step leaves off. After a few layers of colors down and achieve the overall value and color relationship, take a white or light color pencil to mix layered colors together. Then, repeat the same sequence of layered colors(except for the darkest colors). Alternate between the layering and burnishing processes until the paper is completely covered with colored pencils. Underpainting - Layer pale colors such as cream, yellow, beige, sky blue, then dissolve it with solvents or water(if they are watercolor pencils). Darker values and colors are layered or burnished on top for the desired texture. Underpainting also can be used to avoid mixing dark into light colors. In the process, create an overall light color layering and dissolve it with solvents or water. Then add the dark objects over it. Washes With Solvents - With wax or oil based colored pencils, you can liquefy them with a variety of solvents, with each solvent creating its own unique effect. You have to consider the toxicity you are willing to put up. As for the water soluble colored pencils, you only need water. Colors can be layered, then mixed together with a solvent. Or, a solvent can be applied to each layer of color separately as in glazing. Additional layers of colors and solvents do not mix with the layers underneath. Generally speaking, solvents darken the pigments and smooth out the grainy looks of colored pencil layers producing textures with smooth gradations. It is very suitable for subjects like clouds, skies and water. You can use a cotton ball or a dry cotton swab to 'smudge' the colors with or without the solvent. Strokes- You can apply colored pencils through hatching, cross hatching, stippling, etc. But two most effective ways are circular strokes and linear strokes. Practice them a lot and you will gain more confidence. Follow The Form - Apply in the same direction of the contours, texture or grain of the subject if you want subject to look natural and to give them dimensionality. Add Colors Gradually - Applying colored pencils to achieve a pristine look require much patience. This is not a quick medium like others. Keep your pace slowly. Regardless of techniques, add the colors steadily with as little pressure as possible and a needle sharp point. Work Dark To Light - Paint the dark value of a color first, and then add lighter colors on top. The result is a very translucent color. Leave High Lights Alone - If you use white paper, remember to keep highlights free of color first. Only when you approach the last stage, you can decide whether to leave it white or add light colors appropriate for that specific highlights. Practice always makes perfect. You will need to hone in these colored pencil techniques to express yourself well. Take a look at the colored pencil tutorial to see how I combine all the colored pencil techniques.